Situated in the very best part of Claremont Upper, beautiful views, peace, and security abound. Long or short term lease. Suitable for single or couple, or small family. 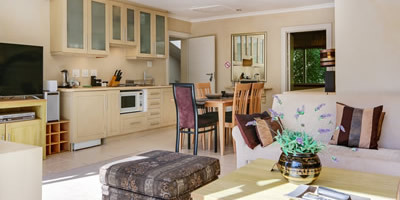 The Apartment is a modern, airy, tastefully furnished, entirely self sufficient living space on the upper floor of the luxury Avenue Torquay Guesthouse, but can be occupied as an entirely separate unit, with all the advantages of the main property : Security, DSTV, WiFi, the magnificent protected mature treed garden and huge pool, stunning mountain views. Servicing of the unit is available, as is an on site laundry. Modern, airy, and tastefully decorated in neutrals & fully furnished. Fully equipped kitchenette, with 2 plate glass hob and convection microwave, toaster, kettle, and any other plug in devices requested. Large carpeted bedroom with en suite travertine full bath room & shower. Fluffy towels, gowns, slippers and toiletry amenities, and hair drier. King extra length bed with feather duvet, pillows and luxurious comforter. Plenty of “His” & “Her” cupboard space plus dressing table insert and Safe. TV and surround sound in bedroom. Underfloor heating through out with air conditioned living space. Juliette balcony off bedroom. View the sunrise! Living space is tiled and has 2 sleeper couches plus linen, and coffee table. Double glass doors open onto large deck off living room with magnificent views of garden, pool and mountain. Sun loungers, café style table and dining area equipped for 6. Flat screen TV with DVD player and surround sound. DSTV Hotel Bouquet. Washing machine and tumble drier, iron and ironing board, or laundry service available. Upstairs and can have a separate entrance.